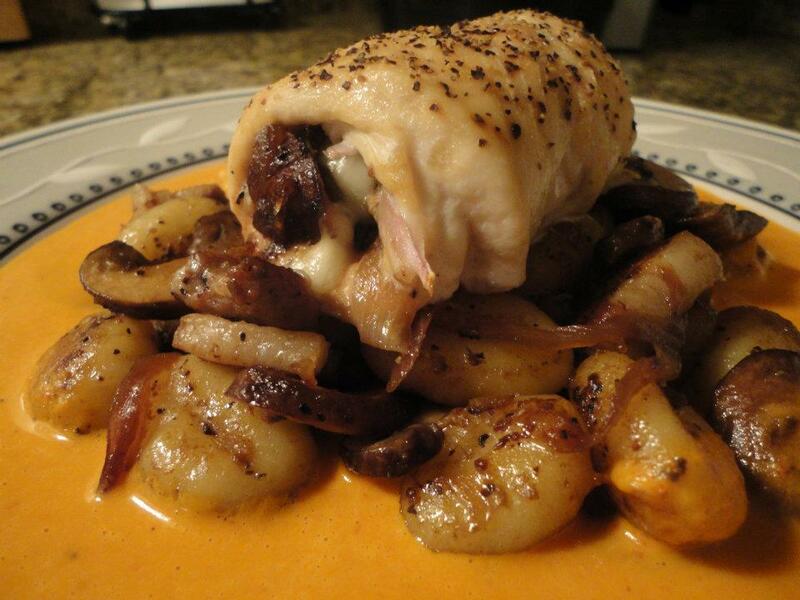 Recipe Request: Danielle asked for “something simple”… Chicken Rollatini, hope this fits the bill! parmesan & black pepper quinoa, and a tomato basil cream. Sounds kind of difficult and fancy doesn’t it? Well it’s not, trust me! Now first thing’s first, you need nice thin chicken cutlets, and you also want to increase their size a bit. Place your chicken cutlets between two pieces of plastic wrap. If you have meat tenderizer, great, if not, use a rolling pin or some other first semi-flat surfaced object. You just want to pound the cutlets out a little bit, this way they’re easier to stuff and cook faster. Just be careful not to go too thin, you don’t want to tear them. Another option… if you have a good relationship with your butcher, they’ll probably do this for you if you ask nicely. I know I used to back in my butcher shop days at Mulberry Street. Ok, so now you have nice thin chicken cutlets. Cut your slices of bacon in half and place two halves on top of each cutlet (or if you’re using pancetta which is round just lay it on top of the cutlet), then put a layer of fresh basil. Finally put the mozzarella stick in the center horizontally and roll your cutlets. Skewer each cutlet on both ends with the toothpicks to prevent them from unrolling. Insert the toothpicks where the edge of the cutlet roll ends and push through the cutlet and out the other side. Brush your rollatini with olive oil and sprinkle with the salt, pepper, garlic powder and parmesan. Place in a baking pan and cook in the oven for 35 minutes. The rollatini should be nicely browned on top and a little cheese should be leaking out the sides when it’s done. Next thing is to get the cauliflower roasting, as it takes nearly as long as the chicken. In a bowl combine your cauliflower florets, salt, pepper, garlic powder and olive oil. Cover the bowl securely with plastic wrap and shake vigorously so all of the florets are coated with the oil and seasoning. You could also put everything in a Ziploc bag and do it shake ‘n bake style. Place the seasoned cauliflower on a baking sheet and put in the oven for 30 minutes. You will need to turn the florets halfway through for even cooking, otherwise you’ll have a burnt bottom. Third is the quinoa. In a medium sauce pot bring your chicken stock, white wine and 1tbsp of butter to a boil, add your quinoa, salt and black pepper and stir, bring back to a boil. Allow it boil for two minutes then reduce the heat to medium-low and simmer covered for 15 minutes. You’ll know the quinoa are done when they’ve formed white halos on the grains. Add the final 1tbsp of butter and grated parmesan cheese, stir until the butter is melted and parmesan is mixed throughout the quinoa. Put the cover back on and set aside off the heat. Last but not least you need to make the sauce, which can be done while the quinoa is cooking. In a medium sauce pot combine your diced tomato, chicken stock, salt, pepper and garlic powder. Bring the mixture to a boil, reduce the heat to medium and add your heavy cream, stir everything together. Continue to simmer for a few minutes then reduce the heat to low. Five minutes before you’re ready to serve take the sauce off the heat and using either a blender, food processor or hand emulsifier liquefy the sauce so you don’t have tomato chunks. After you’ve liquefied the sauce add your chopped basil and stir it in. Allow the sauce to rest covered for a few minutes before serving to allow the basil to release it’s flavor. Remove the toothpicks from the rollatini and put ’em on the plate, spoon some of the cream sauce over the top. Plate your quinoa and cauliflower… Perfect, you’re all set. So you have four different components to the dish, but nothing is a difficult skill level. The only minute challenge is time management, staggering everything so that it comes together at the right moment. The best part is, it looks and tastes amazing without being hard. Your friends and family will be impressed, I promise! So that’s it, recipe, pairings and all. New posts coming soon, in the meantime crack open a bottle of something and relax. Life is short, enjoy it! Tags: bacon, basil, chicken rollatini, easy dishes to cook, pancetta, quinoa, tomato cream sauce. Bookmark the permalink.